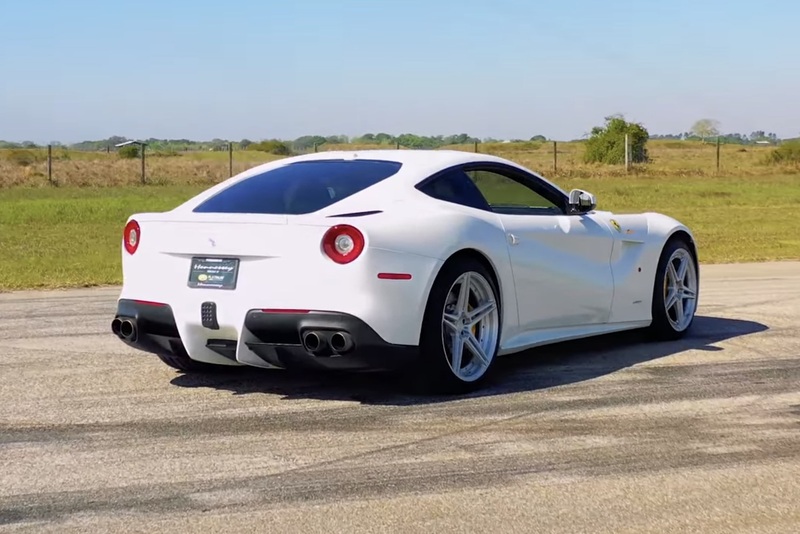 Hennessey Performance recently posted a video of its HPE800 Ferrari F12 testing on a racetrack, and it’s pure elegance and madness all at once. The Ferrari F12 Berlinetta is no typical car, and after Hennessey gets its hands on it, the car is an 800 hp pissed off beautiful Italian creation. In its standard form, the Ferrari F12 Berlinetta has a 6.3-liter naturally aspirated V12 that makes 730 hp and 509 lb-ft of torque. After the tuner company takes it into its garage and has its way with it, the car comes out with 800 hp and beautifully angry exhaust note. Hennessey doesn’t have a whole lot of information about the car on its website at this time. The video description that accompanies the video below simply listed the company’s main website instead of a specific page for the car. All we do know is that it will make 800 hp and look darn good doing it. This seems like the best way to forget about the Ferrari 812 Superfast. That particular car comes with 789 hp from the factory and this model beats that out. Suddenly, the Superfast doesn’t look so super fast. Hennessey has several other projects in the works right now judging from the company’s news page on its website. It’s safe to assume the tuner company will keep putting out amazing cars. Watch the video below to see what we mean.